When I as a kid growing up we did not take family vacations every year. What vacations we did take were all by car and mostly to nearby states. I don't think we took any vacation at all half the years I grew up. I never thought this was abnormal and I never felt I was being "cheated" by not getting to go on vacations. We didn't go to a Disney theme park until I was in my late teens. There were 3 specific vacations we took while I was growing up that were specifically memorable including the Disney trip. Any other vacations we took were camping trips or the like that I don't really remember specifically. My family didn't have a lot of money growing up. As a kid I knew we were not rich but I didn't think we were poor. I thought we were somewhere in the middle. Sometimes I wanted more toys or a new bike or wish my family had a fancier house or nicer cars. But I don't ever recall wishing my parents would take me on vacations. I never yearned for travel or vacations as a child. I don't think most children naturally desire to travel far from home nor expect it. I think that outside influences cause people to feel vacations are necessary. Kids may see marketing by Disney or other theme parks and get the idea that they "need" to go on a vacation to such a destination. But if we bought our kids every thing they saw on a commercial that they wanted then they'd have every toy known to man. Parents see their peers and others going on vacations and feel it is the expected norm and then decide it is something they ought to do. And of course parents may want to take vacations themselves for the enjoyment of it. If we bought everything we wanted we'd all be broke. A combination of parental want and perceived needs of the child can be used to justify expensive vacations. I think that some parents take their own desires for a fun vacation and then using the rationale that their kids 'need' it to justify an unwarranted luxury expense. If you were broke and single and wanted to go to Las Vegas would you spend that money? If you did it would clearly be a frivolous expenditure. But if you're married with kids and want to go on a vacation then you may feel it is 'justified' since the kids need it as a normal part of growing up and you don't want them to go without the normal things you think kids should have yadda yadda yadda. Younger children do not remember vacations or don't remember much of them. I vaguely remember a trip to San Francisco as a very young child and about all I really remember was riding the San Francisco cable car and buying cable car toy. I have a vague recollection of going to Montana at some point when I was young and all I recall of the trip is that it was muddy. My wife went to Disneyland when she was 2-3 years old and she doesn't remember the trip at all. Her relatives remember the trip and they have some pictures to prove it. I hope our parents didn't spend a lot of money for those vacations as I am only left with two notable memories and my wife doesn't recall her trip at all. In my opinion, I would say that taking a child on a vacation when they are under 7 years old is basically a waste of money cause they probably won't remember anything about the trip. If you look into the data on spending at Bundle.com under the 'everybody's money' section you can find out how much different demographic groups spend on travel expenses. The image on the left is from the Bundle site. 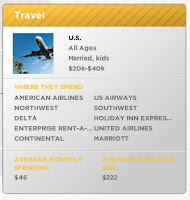 : Married families with kids making $20,000 to $40,000 per year spend an average of $46 per month on travel expenses. Thats annual average spending of $552. That may not sound like a lot of money but if you're a family with kids making under $40,000 then your basic expenses are relatively high for your income level and $552 a year is a large amount. Sending on travel and vacations can have a significant impact of a family, especially families with lower income levels. Vacation spending is a luxury and not a 'need' at all. It is not abusing your children if you don't take them to Disney World every few years. In fact your children do not 'need' to go on any vacations at all. Vacations are a luxury expense that should fall very low on your spending priorities. Of course vacations are fun and I'm sure most people enjoy taking them. It is natural that people 'want' to take vacations. If you can afford it then that is great, I think you should enjoy a nice family vacation now and then. But if your family has cash problems or is having a hard time saving for basic things then spending money on a vacation is an unnecessary luxury. You should not feel obligated to take annual family vacations and doing so should not be prioritized over spending on basic needs or saving money for your retirement.